SNK has been working together with Sony to bring it’s PS2 Neo Geo re-releases to PS4 by way of the Playstation Network Import Store. King of Fighters 2000 is already available, and this past week, SNK released the Fu’UN Super Combo, a PS4 compilation which is a re-release of two of the Neo Geo’s more obscure fighters, Savage Reign, and its sequel Kazuna Encounter. They were two of several me-too 90s fighters that while were fairly enjoyable, never really caught on. Kizuna Encounter added a tag team mechanic, but that too failed to make it popular. Characters from the game have shown up in King of Fighters XI and Neo Geo Battle Coliseum, but that’s the extent of their popularity. The two games were originally re-released for the Japanese PS2 and never saw a US release, so this is an import (although players can change the language to English). The game will also include arranged soundtracks, and a color edit mode among their enhancements. 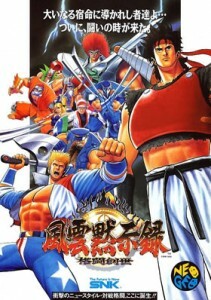 Savage Reign and Kazuma Encounter were never the most popular games when they were first released on the Neo Geo, but hopefully they will be better received by a new generation of fighting game fans. Even more obscure SNK goodness is hitting the Neo Geo early next year, as SNK is bringing over ADK Damashii, a compilation of PS2 Neo Geo releases that includes Aggressors of Dark Kombat (not Mortal Kombat), Ninja Master�s: Ha? Ninp? Ch?, Ninja Combat, Ninja Commando, and Twinkle Star Sprites. On the subject of more popular and more recent SNK games, KOF XIV received a DLC update earlier this week. Anthena’s classic costume is available as free DLC for a limited time. The content also includes some PS4 themes as well. Meanwhile an even bigger free update comes in the form of version 1.10, which is scheduled for January 11th, 2017. The patch will improve the game’s visuals and add new color selections for the game’s characters. This is a nice touch for KOF, as usually we’ve seen DLC that people have to pay for when it comes to fighting games these days. It’s also rare to see DLC that goes towards improving what was already an excellent-looking game. We learned at the Playstation Experience earlier this month that Kuma and Panda would be playable characters in the game, and this time they would be separate characters each with their own movesets. The game will also include an online tournament mode. Also earlier this month, a new build of the console version was shown at Bandai Namco’s Thank You Festival at KINTEX in South Korea. This build shows off the select screen, reveals 2 new levels, and confirms that Lee Chaolan is returning to the cast as a playable character. Tekken-official.jp revealed a recent update for Fated Retribution called the “Kiwami” (Ultimate) Campaign, which introduces dozens of new costume pieces for the game’s fighters, each of which can be edited in the game’s Color Edit mode. Speaking of costumes, Namco is running a cross promotion with New Japan Pro Wrestling. So far, the only fruits of this collaboration include a special costume for King inspired by current champion Kazuchika Okada. Tekken 7 is hitting US shores next year, so we should no doubt be learning new character details along with a release date in the near future. Killer Instinct has come a long way since its release as an Xbox One launch title. Iron Galaxy recently released solid gold skin packs for Jago, Orchid, and several other characters. Beginning next year, Killer Instinct will feature some new characters and other enhancements in patch 3.6. One of them, Killgore, can be seen above. Other new features in 3.6 includes new content for Shadow Lords, a new costume for Thunder, Bug Fixes, and character re-balancing. More Killer Instinct is always a good thing, and I can’t wait to see who the two new characters are. New Fighting Game Coming To……SNES!? That’s right, you heard me. A group of EX-SNK employees is bringing Unholy Night, a fighting game, to Super Nintendo early next February. Featuring 6 fighters and unique character designs, Unholy Night will ship on a 32-Megabit cartridge. It looks like the game is headed to the Chinese market with no word of a western release. While it isn’t unheard of to have developers still making Genesis, Neo Geo, and Atari Lynx games, this is one of the few times I’ve heard of a new Super Nintendo game, especially 16 years after it’s last mainstream title and 13 years after it’s manufacturing has been discontinued. Hopefully they decide to give us a U.S release of some sort, even if it is via steam.